Step up your fashion game this weekend by wearing this shift dress from Miss Chase. This dress will ensure a perfect fit, courtesy its cotton fabric. 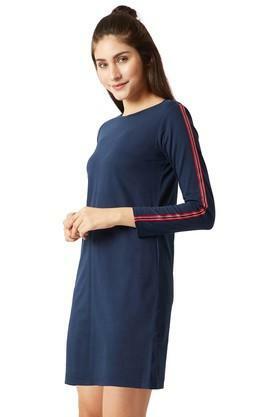 Featuring a round neck, full sleeves and solid pattern, this dress possesses a stunning finesse. Pick a casual style that spells freshness, simplicity and comfort with this top. Create a sophisticated style by teaming this top with a pair of strappy sandals.